ST. GEORGE — Two women were transported to the hospital Friday afternoon following a collision that occurred near 450 S. Bluff St. in St. George. 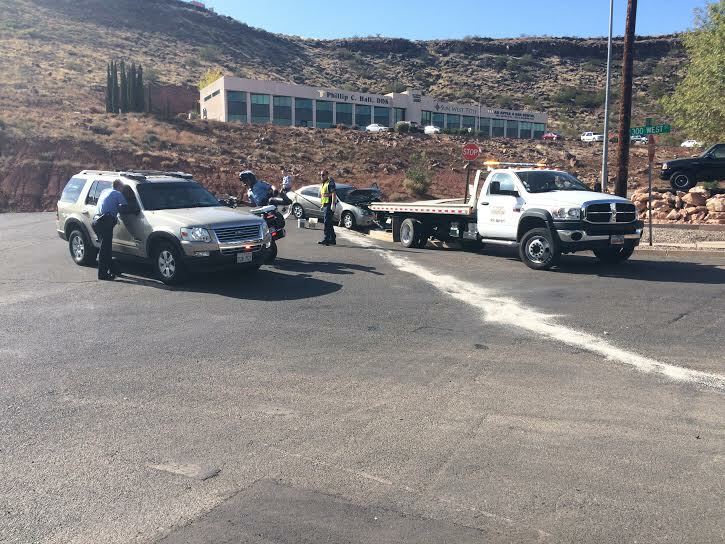 Shortly after noon, a woman driving a Nissan Altima was traveling northbound on Bluff Street in the outside lane, St. George Police Officer Tyrell Bangerter said. 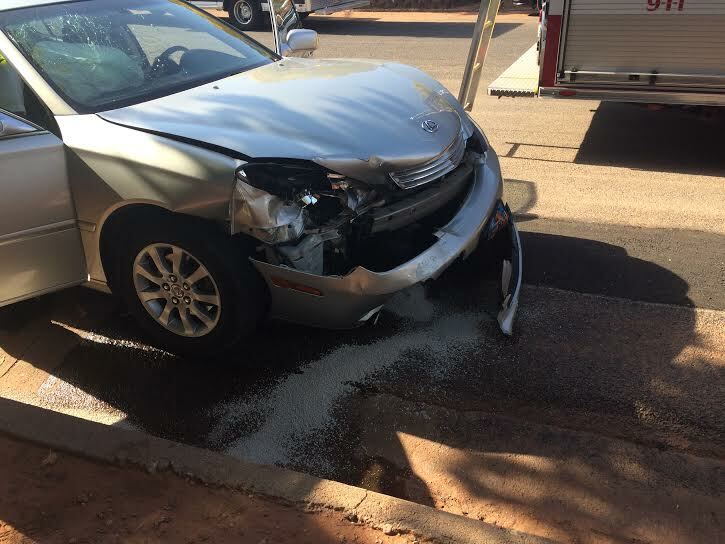 At the same time, a woman traveling southbound in a Lexus merged into the left-hand lane and proceeded to turn left in front of the Nissan, and the two vehicles collided. 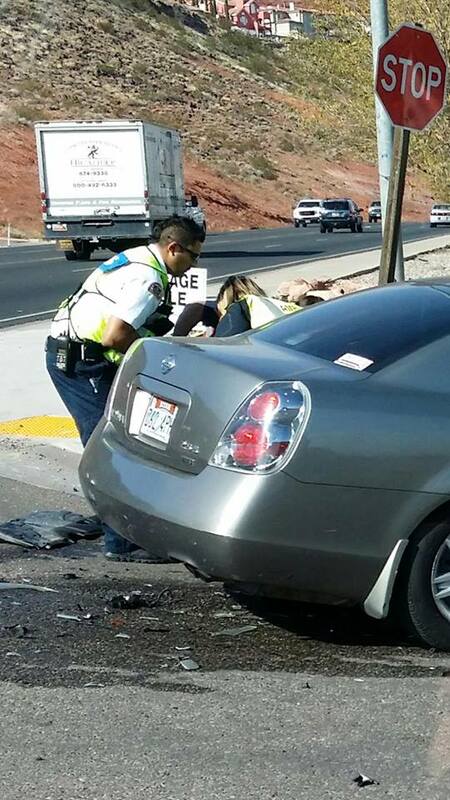 “They hit at an angle, front to front,” Bangerter said. 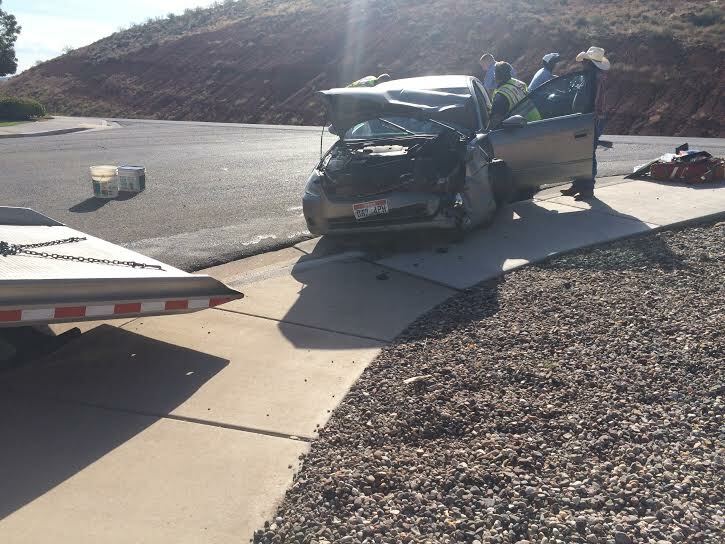 St. George Fire Department, St. George Police officers and Gold Cross Ambulance responded to the scene. The driver of the Lexus was transported with minor injuries to Dixie Regional Medical Center by Gold Cross Ambulance. The driver of the Nissan suffered a broken ankle, Bangerter said, and was also transported to DRMC by Gold Cross Ambulance. The driver of the Lexus was issued a citation for failing to yield on a left turn, Bangerter said. 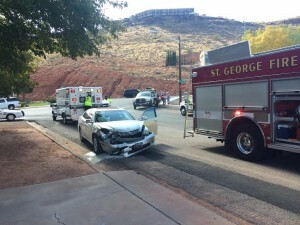 St. George News reporter Aspen Stoddard contributed to this report. Aren’t we really getting tired of these left-turn accidents on the arterials? It seems like it is way past time to install medians (like on St. George Blvd.) on Bluff, River Road (if possible, darn state highway) and the like around town, and let the bloody merchants complain. How many accidents do folks have to endure so lazy people can whip a left turn wherever they feal like?? How fast were they going? Isn’t it 40 or 45 mph on S Bluff? Seems as though the average speed is 50 to 60 when I’m passed! Low skilled drivers who turn left into oncoming traffic can cause accidents at 20 miles per hour . Alas , some people are home schooled for driving and NEVER learn NOT to turn left into oncoming traffic . Even where there are left turn slots, as on Dixie today, and as on many other locations, nothing will stop an idiot who wants to turn left RIGHT NOW from doing so. I was alert enough a couple hours ago to while heading east on the Boulevard to slam on brakes when someone turned left in front of me to go down 800 East. And equally blessed that the car behind me, which was following too close, also hit the brakes in time to not rear end me. Make it unlawful for women to drive on any street in Washington or Iron Counties on Fridays. I’m willing to bet they were not wearing a proper head covering and talking on their cell phones to boot. Was this caused by babies latching on? While doing pilates and yoga exercises, too? Is SG going to be renamed Crash City?